I’m delighted to be participating in the Fragile Latitudes exhibition at the Step Gallery, Arizona State University, this autumn. The exhibition will feature my work, the great escape, which was inspired by my Arctic artist residency. 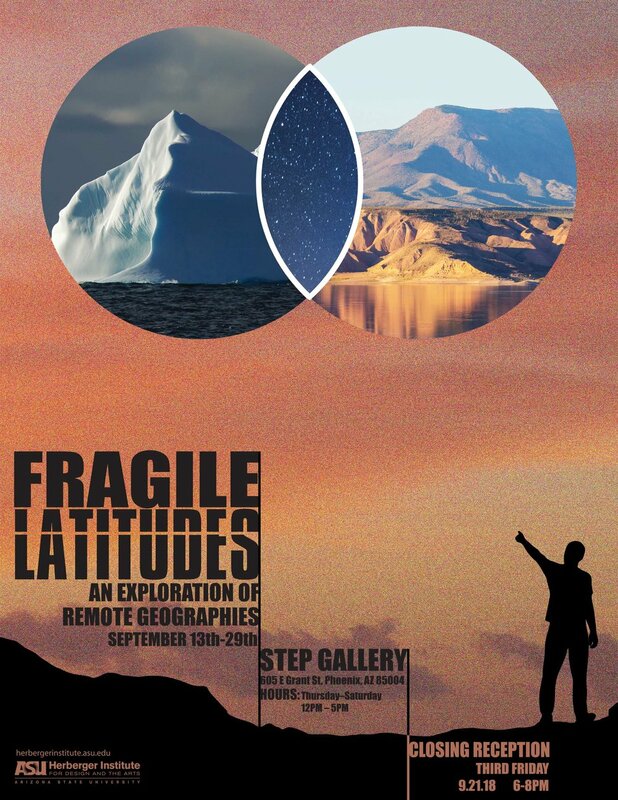 Fragile Latitudes is a collaborative international exhibition addressing the parallels between two desert environments, one in the arctic latitudes of Svalbard and the other in the Sonoran desert. This interdisciplinary exhibition proposes a contrast and comparison between two liminal desert environments, one cold and one hot. A frozen region, Svalbard, like Arizona, is defined as a desert. Although it is cold, it is arid. This arctic desert and the Sonoran desert share visual and geographic similarities. They are extreme and demanding environments, sustaining complex yet definitive ecosystems. Both regions have long vistas, big skies, and constrained chromatic landscapes. Because both environments are extreme, there is peril in venturing unprepared into the landscape. Both regions are unforgiving, yet fragile, sensitive barometers of environmental shifts. It is in environments such as these that the impacts of climate change are first revealed. The environment is bigger than the individual, not containable, hostile, alien, and hauntingly beautiful. The intent with this exhibition is to compare these environments in an exhibition pairing selected artists with similarly minded artists who have been inspired by these different desert locations; The artworks consist of photographs, videos, framed writing segments, music, poetry, drawings and small sculptural work. The show will have both regional and local aspects, yet be international in scope. While some of the proposed artists address landscape, weather, and nature, others address the animals, people, and social structures that sustain themselves in extreme environments.